Labour’s 2017 manifesto included some ambitious elements within its rather unsung and under-publicised Culture For All section. A £1 billion “cultural capital fund”; a commitment to diversity; encouraging housing developments and music venues to co-exist; combatting the “value gap”(i.e unpaid ‘content creation’, particularly online); an arts pupil premium and the provision of career guidance counselling specifically for artistic purposes were all positives, even if the latter two were more like holdovers from the previous general election. However - and notwithstanding the oddly jarring addition of the “continued honouring of the 1st World War” via the 14-18 NOW initiative - Labour’s 2017 vision was more detailed and far less vague than the “Arts and Culture” section of Ed Miliband’s 2015 iteration. The increased emphasis makes sense - Corbyn seems to care about culture. He has lauded 2018 Mercury prize winners Wolf Alice for their advocacy of increasing access in music education, and one of the successes of last year’s election campaign was the emergence of the #Grime4Corbyn moment, particularly in terms of galvanising a youth vote formerly stereotyped as “apathetic”. The cultural formation of Corbyn himself - at different points he proclaimed James Joyce’s Ulysses as his favourite book, at others The Ragged Trousered Philanthropists by Robert Tressell - seems populist to a point, but also patrician. To this writer at least, it seems particularly English; high culture combined with left-WOMAD/CND folkism, and modernism alongside art of “the people”. The present leftward shift in the Labour party can attempt to fuse these divergent tendencies - the value of commercially successful popular forms, as well as more grassroots work, encompassing relatively unpopular experimental and DIY currents. None of these are necessarily left-wing, of course. However, a politics that advocates for the importance of imaginative culture needs to argue for both popular and unpopular culture - we needn’t require legitimation by the market as a productive part of “the creative industries”. More than this, a core political avowal in favour of art, broadly conceived, speaks to the power of individual liberation within the collective that is the hallmark of a dynamic democratic socialism. Corbyn seems to get this - even beyond his appearances at Glastonbury - and can rely on ‘cultural socialists’ as a solid part of his base in the same way that National Collective harnessed artistic support in the lead up to the 2014 Scottish independence referendum. Yet could this go further? The structure of feeling at present could also sustain a renewed ‘popular modernism’. Coined by the sadly departed cultural critic Mark Fisher, popular modernism is an aesthetic project devoted to disseminating challenging, experimental art that is also readily accessible to a wide audience. 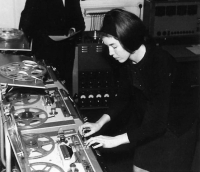 For Fisher, Delia Derbyshire’s pioneering electroacoustic work within the BBC Radiophonic Workshop in the early 1960s, and The Jam’s commercial success in the early 1980s both fit within this category - the former cultural moment a significant product of an ambitious, pioneering BBC. Another emergent sphere of potentially progressive cultural production is in the broadly conceived field of Art Therapy. This area, again, needn’t be limited in scope, or instrumentalized as a cost-cutting venture within the NHS. The germs of this are already here: Cageian initiatives that take long-term mentally ill patients on field recording exercises around the hinterland of Langdon Hospital broaden the definition of what counts as “music”, covered in the previous edition of The Wire1. Here in Scotland, Glasgow’s Sonic Bothy is an inclusive experimental music organisation that aims to foster creative expression amongst people with and without special learning needs, spreading out to include residences and workshops whilst dismantling the dichotomy of “sick” and “well”. These moves, by contrast with an empty vessel model popular amongst conservatives that seeks to “fill the proletarians with useful culture” (another element of a doctrine of “social rescue”, as Raymond Williams described in The Long Revolution)2, instead encourage agency, self-worth and empowerment. Yet therapists and facilitators are hampered by chronic underfunding and a heavy reliance on emotional labour, as well as a preponderance of short-term, precarious contracts. All the while, neoliberal doctrine maintains a thin pretence of caring about both arts and mental health funding. In lieu of any meaningful intervention, positive initiatives such as Girls Rock Glasgow are dependent upon the largesse of well-intentioned private donors - after the rejection of a funding application by Creative Scotland, financial security was provided by Lauren Mayberry of the highly successful electro-pop band Chvrches. Welcome though this is in the present conjuncture, there is no reason that this needs to be maintained under a future socialist government which could make publicly funded and decentralised provision for such initiatives. In a remarkably prescient critique of New Times - a bowdlerised version of which arguably produced much of the ideological justification for the Blair era’s continuity Thatcherism - Avi Sivanandan questions “Can a socialism of the twenty-first century survive which does not develop landscapes of creative leisure for people to be human in?” This is still a fundamental question that remains unanswered. Working class cultural expressions have indeed developed through market mechanisms and without institutional support. Yet the sheer extent of inequality of access demonstrates an urgent need for state intervention, as shown by the dearth of BAME and working class representation, not to mention the underpinning of all of this by unpaid labour. A long-term goal, connected to this, should be to constitutionally reform the ancient, quasi-feudal British state in order to embed progressive values within governance - a commitment to public ownership, democratisation, workers control, electoral reform, federalisation, etc - without which any of the revised ideas contained in ‘Beyond the Manifesto’ could be easily rolled back. The arts - though sometimes viewed as relatively autonomous - are still subject to the diktats of neoliberal structures. It’s time to fundamentally change these structures. Art cannot be the sole property of bourgeois culture, nor should arts funding be the preserve of ‘cool capitalist’ petit-bourgeois middle management. Government funding and intervention in the arts should not be atomised - for a sustainable culture, we need intervention into public house building, the provision of new forms of welfare (e.g livable UBI), constitutional change, lasting arts’ infrastructures (public cultural centres etc). Publicly funded art need not be anodyne and of a singular, earnest mode; employing the residual and the emergent to combat the dominant can be, by turns, abstract, experimental, multi-accented, funny, realist, absurd etc - in other words, genuinely pluralist. Tackle the bifurcated nature of the arts by redistributing high art income towards grassroots initiatives, just as skyrocketing earnings within the Premier League will be tackled by a redistributive wealth tax. The arts - visual, musical, sculptural, literary - should be compulsory and taught in all schools nationally throughout a person’s education, with a spirit of multicultural and cross-class plurality; oppose the elitist grammar school revanchism of Gove et al. This is not for the benefit of our economy, but rather for the health of our citizens.